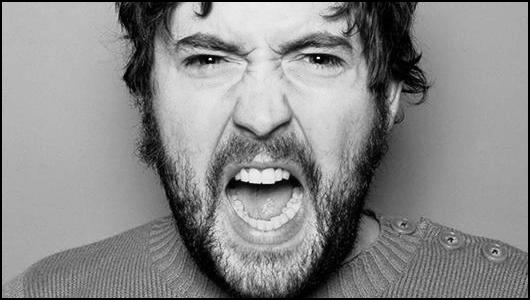 Review: Nick Helm: This Means War! – Pleasance Queen Dome, Edinburgh. One part disgust, two parts fear and one part pity. These are the emotions, almost palpable, that form the collective experience of Nick Helm. His ability to generate this level of compulsory spectator involvement has provided the framework for the past two compelling performances – and it brings him a considerable degree of success in this show too. As ever, Helm attacks with gusto, sweating ferociously, bellowing in a manner that will definitely damage his vocal chords one of these days. A very physical presence on stage, Helm uses his body to both amuse and unease. He happily removes various items of clothing – beginning in full military garb, and ending in something a little more revealing; his T-shirt is torn to shreds with his teeth, which takes quite some time, and his body, which could have been purpose-built for comedy, is a sight to behold. But the primary relationship, as ever with Helm, is between himself and the audience. During this show, one poor sod is required to sit on stage throughout the performance peeling potatoes. They’re also the subject of various gags, songs and set pieces, including an overlong game of Russian Roulette with a couple of cans of fizzy orange pop. If anything, this proves that there’s very little difference between Fanta and Tango; although Helm hates Fanta, loves Tango. Such are the vagaries of the human spirit. As an audience member, you’re never entirely safe, with whole rows being forced on stage to chant “Helm, Helm, Helm”, and dour facial expressions in the early rows coming in for aggressive criticism from the stage: “I have to perform for an hour in front of that.” It’s a gripping experience, and Helm adds to the intimacy of the show by ‘weeping’ over the problem he has in trying to replicate his Comedy Award nomination last year. While, oddly touching moments – these occur several times… – in some ways, it’s the real problem with this show. In both structure and content, This Means War is incredibly similar to last year’s effort. For newcomers, it’s a genuinely memorable experience. Helm achieves a remarkable degree of consistency for work which relies so heavily on the audience, and this is no doubt due to the captivating vigour with which he inhabits this lonely, desperate character. Anyone familiar with Helm’s work in Edinburgh, however, will be disappointed by the lack of development.